An original 1940s Art Deco house stands at the foot of a brand new, ultramodern high rise, seamlessly blending mid-century chic with contemporary luxury. Both distinct areas are adjoined by a patio designed by Dimore Studio to create a space where classic and current perfectly complement one another. The mansion house was part of a French colony that developed on the outskirts of Guadalajara in the last years of the 19th century. Over the next fifty years, the neighborhood experienced steady growth, resulting in streets lined with French Art Deco mansions like the one that serves as the original historic property of Casa Habita. Today, Lafayette’s art and dining scenes are undergoing rapid revitalization in one of the fastest-growing cities in Mexico, creating the unique combination of old and new that Casa Habita embodies. 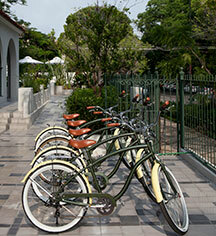 The historic mansion houses the upscale lobby with a bar, as well as a gourmet restaurant. On the roof, a pool, bar, and terrace comprise a common area with ample space for socializing and relaxing. The patio behind the house naturally leads to the state-of-the-art tower, housing a gym, conference room, and 37 luxuriously appointed guestrooms and suites, as well as a full-service spa overlooking the city. Location and design are the main ingredients at Casa Habita, where art, fashion, style, architecture, and history come together. 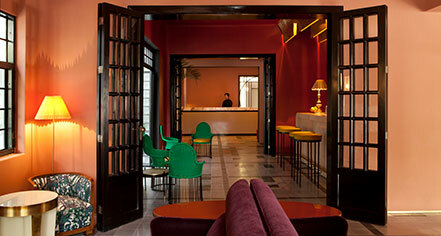 Casa Habita, a member of Historic Hotels Worldwide since 2017, dates back to 1938. Designed by Grupo HABITA, with local architectural firm Estudio5, and interiors by Dimore Studio, the hotel renovation displays the history of the region through locally sourced materials and pieces, as well as spectacular views of Guadalajara. Cancellation Policy: Cancellation and prepayment policies vary according to rate, package, or room type. Parking: Valet and self parking available. Pet Policy: $50 per pet, per night. Shuttle Service: Area shuttle available; rates apply. Located in the heart of Guadalajara’s up-and-coming Lafayette neighborhood, Casa Habita is the new epicenter of a vibrant urban community. Learn more about the History of Casa Habita .